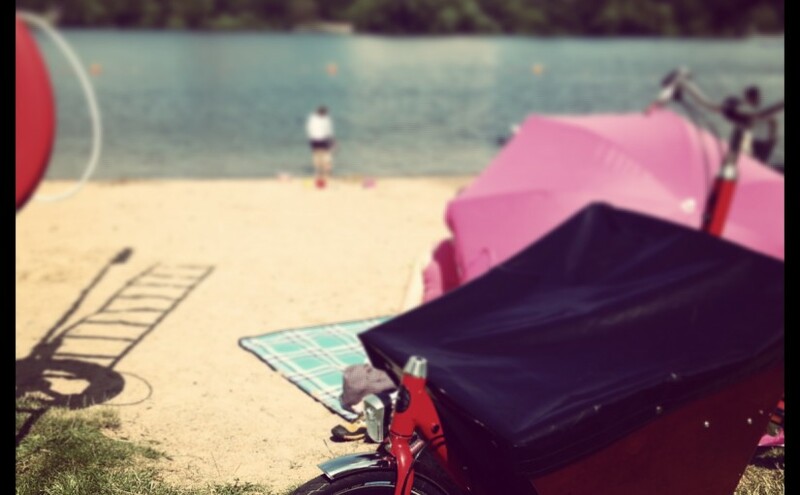 The Bakfiets is doing well, thank you for asking! And to all of you who think commuting by bicycle through the winter is not possible I tell you, it is. It’s even possible up here in Stockholm with a cargo bike and it’s lots of fun. PS. I will update the gallery as snow keeps falling. 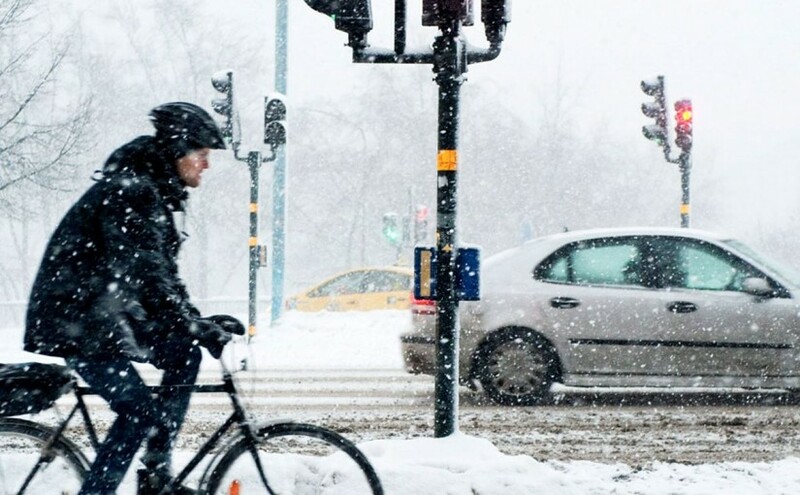 Lots of people treat winter as the bike commuting off-season and most winter cycling tips out there are either written by buy-as-much-accessories-as-you-can-but-seldom-ride cyclists or people who just don’t ride their bike at all during winter but believe their opinion matters nonetheless. 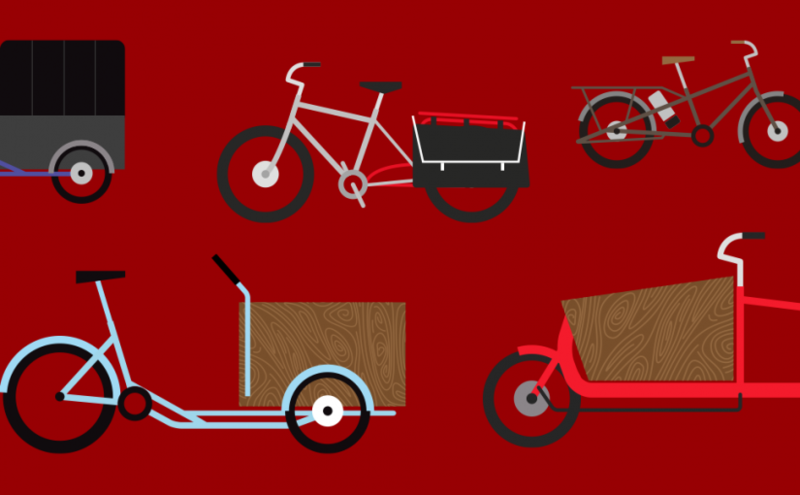 I’ll soon bicycle commute for the fourth winter in a row and I’ll do it with the CargoBike (Bakfiets.nl) Short for the first time this year. I tried to find information on what kind of tires people use to get these tanks roll through snow but could not find many different alternatives. I’ll keep you posted. Let’s roll. It’s been exactly four months since Fizz #1* and I pedalled back home on a classic Dutch Bakfiets we picked up at Gamla Enskede Lådcyklar. Four months and 1000 kilometers in the saddle later I believe time has come for a few pictures and some feedback. We’ve been to places, we’ve transported stuff and we’ve had fun, a lot of fun. I guess that’s sort of what I expected the experience would be but I have to admit it’s been even smoother than I anticipated. Never in the last four months did the bike fall short and a bigger vehicle was needed. It just does the job. It does the job and IT JUST WORKS. I’ve come to a point in my life where I want stuff that just works. I really can’t be bothered with fixing and tweaking anymore and if there is something I love about this box bike is that: it works. I have not had a single mechanical issue in 1000 kilometers. Nothing. Nada. Rien. Ingenting. I barely had to pump the tires now and then to keep the pressure required for heavy duty. That’s how things should always be. Period. Maybe it’s a little too early for a proper review though. Temperatures (slowly) begin to drop and I have yet to swap the Schwalbe Marathon Plus for a pair of mountain bike tires that I hope will help keep the rides fun and safe during winter. At the same time Fizz #1 is also looking forward to sitting next to Fizz #2. Fizz #2? Well… she doesn’t know it yet. Twice the fun soon? I suggest we meet here again in a few months. * You got that? Right? 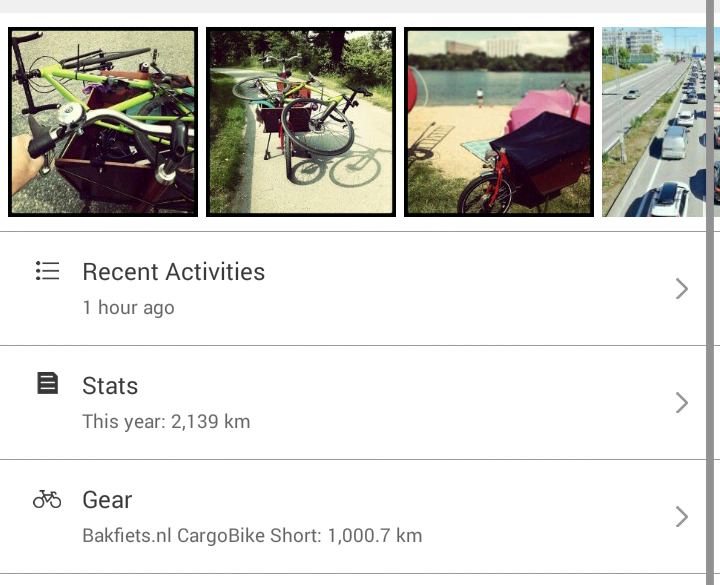 Two weeks and two hundred kilometers later the Bakfiets.nl CargoBike Short is already part of the family daily routines. We’ve been thinking about getting rid of our car for a while but it really took the imminent birth of Pignon Jr. #2 for us to set things in motion. I have always been riding with Pignon Jr. #1 to preschool and other places already but the car came in handy once in a while. It also came with all the costs associated to convenience which, at the end of the day, are just not worth the money. One of the biggest argument against owning that particular car though was that it simply is not a family car (3 door-VW-Golf-kind-of gas sucker). Owning a car “designed” for things a family of four tends to do and carry would basically mean, for us, owning another, bigger car that we would still only use twice a month or less anyway. And that’s pretty much how the whole family ended up at Gamla Enskede Lådcyklar on a Sunday afternoon just a few hours before Måns closed the store for a month. After so many weeks (months?) 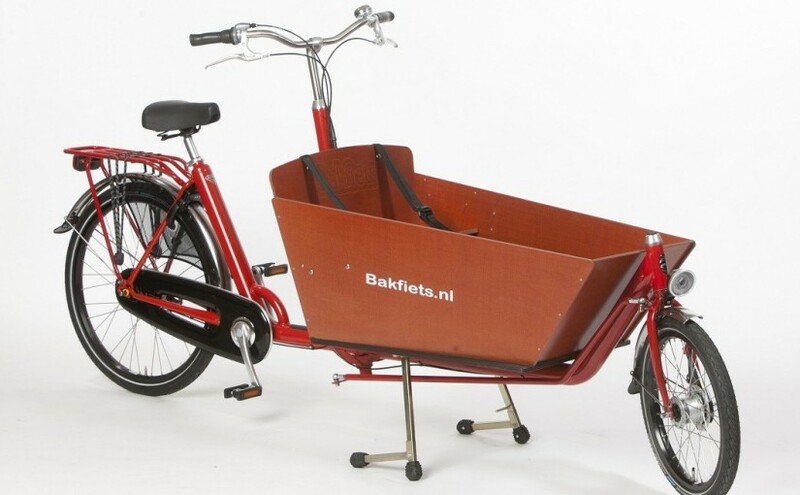 looking at cargo bikes specifications, reviews, and videos online I was sure I would ride a Butchers & Bicycles MK1-E back from the shop (it was actually because Måns had a MK1-E available that we went to his shop in the first place). But he, Måns, did what not too many shop owners do anymore and guided us through the process of choosing the right bike for us and our needs and had us try several cargos that he suggested (in the following order) we took for a spin. We first tried a trike (I came for a MK1-E remember?) and pedalled around the block on a nihola.com Family which -it was the first time both Madame & Monsieur Pignon rode a trike- was a very nice introduction to three-wheeled bicycles. Next, we tried the Butchers & Bicycles MK1-E -finnnaaaallllyyy- and… I’m glad Måns got it back in one piece! Last we tried what I thought I would never ride (and like) ever -for reasons I still can’t really explain- and within a couple of seconds knew it was exactly the sort of bike I had to have: a classic Dutch Bakfiets. We (Madame Pignon is 8 months pregnant) tried both the long (Måns’ bicycle with electric assistance) and short versions and felt -probably due to the fact that they are pretty much regular two-wheeled bicycles, only a bit longer- like we always have had one. Easy to ride, easy to manoeuvre and easy to maintain (not much can go wrong on simpler machines). 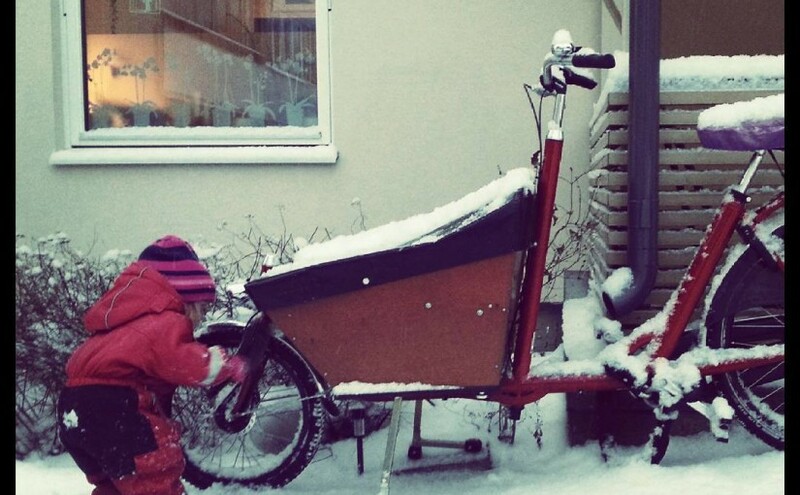 We had a deal -18,000 SEK- and rode a Bakfiets.nl CargoBike Short home. Two weeks and two hundred kilometers later then and I would like, once again, to thank Måns for his help and for opening the shop on a sunny Sunday afternoon on his way -on a cargo bike obviously- to the lake. You’ll probably see us again sometime in the future… that box already feels too small. 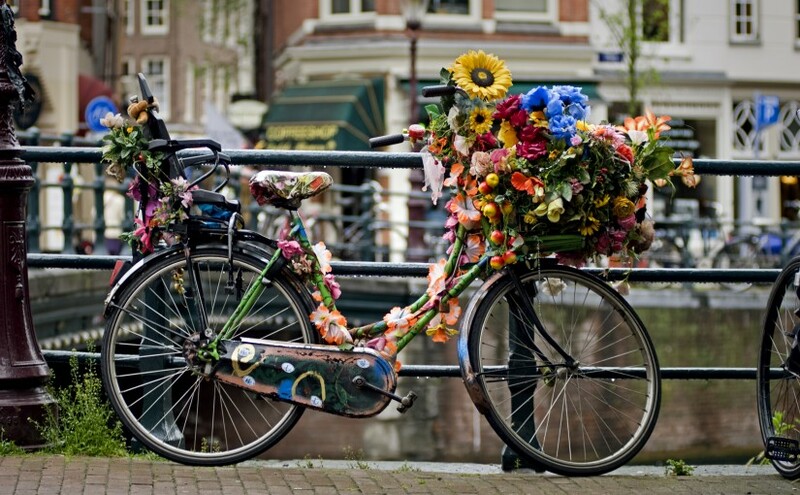 Riding a bike for one hour extends the average cyclist’s life by the same amount of time, according to a study in the Netherlands, which also found that they live six months longer than people who do not ride bikes. Some say Sweden is the most Americanized country in the world. 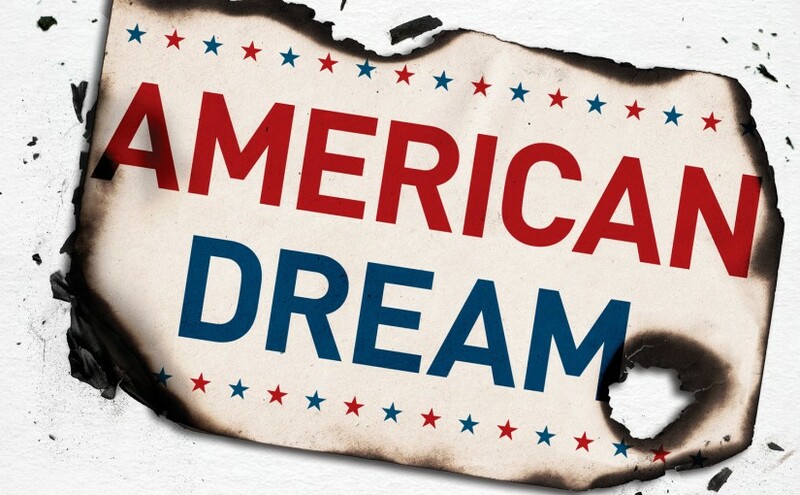 I’m not so sure it’s the 51st state yet but it’s definitely going in that direction. Driverless vehicles have been wandering around Sweden for a while already and it’s become normal to read things like “Snowplow runs cyclist over” or “She was run over by a black Golf” even in the most influential newspapers. I hadn’t read the “Oops, wrong pedal!” (very popular in the U.S. and New York City in particular) gambit yet though but it’s finally here and Sweden is definitely catching up. Motorist pressed the wrong pedal – drove off the road. Hagsätra. It can go bad if one mistakes the gas for the brake. Police was called out to Hagsätravägen after a motorist drove down a hill and into a parking lot last week. This was the result of a driving student mistaking the gas pedal for the brake. Both the student and the driving instructor had to go to the hospital. No one else was injured but we might not be as lucky next time it happens around a playground or a busy terrace. I would have liked to read that the student and instructor had been charged with something because that kind of “mistake” means they both should, in my book, never be allowed behind the wheel again. Ever. 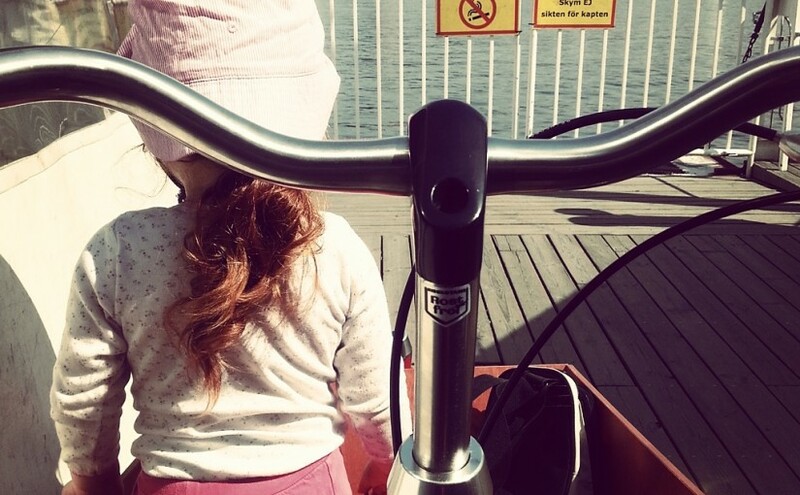 On May 27, the City of Stockholm and Naturskyddsföreningen (the most influential non-profit environmental organization in Sweden) will give goodie bags to cyclists around Stockholm as a thank you for riding a bicycle (“tack för att du cyklar”). 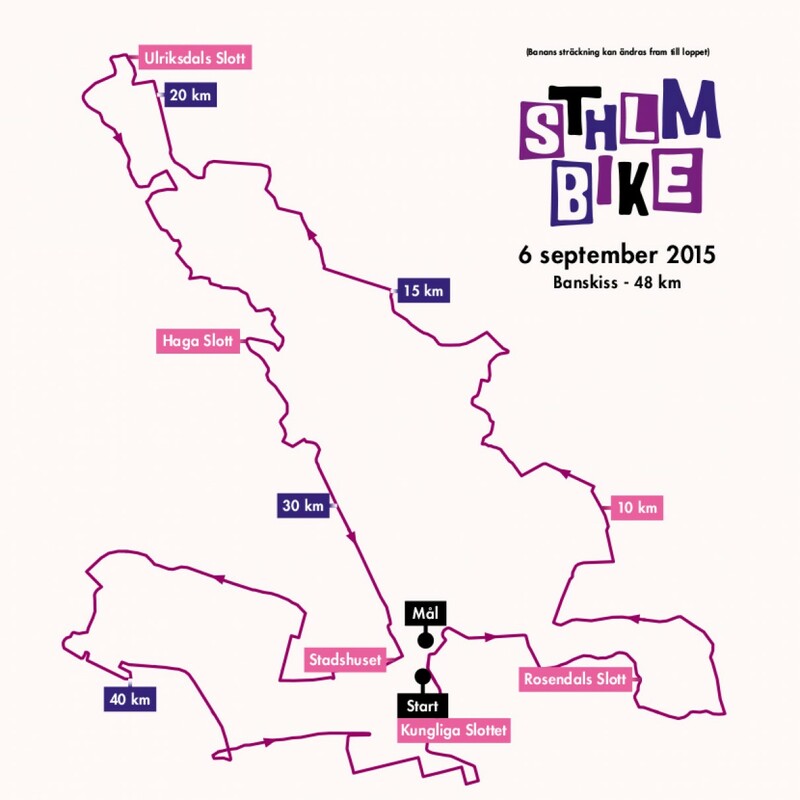 Will you commute by bike on May 27 and ride by one of the check points to get a bag? What do you think the goodies will be this time? Or, if you’re reading this afterwards, what did you get?